I’ve written previously about liking the powerful effect a black background lends to some photographic images. This year, in France, we were in a position to get a few such images again. Once more it was, of course, more by luck than design. In this case, luck came in the form of a shaded woodland walk beside the very first few kilometres of La Rigole, a purpose built small canal feeding water into the Canal du Midi. Bright sunlight filtering through broad-leafed trees is a typically high contrast situation and, hey presto, some very dark backgrounds become possible. 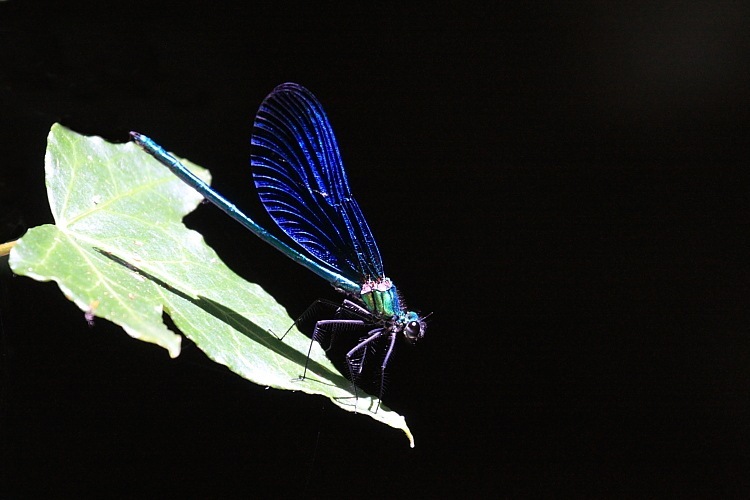 La Rigole gave us our first encounters with Beautiful Demoiselles. That’s a pretty crappy but nonetheless appropriate English name, in my opinion. Let’s give such a splendid creature its equally splendid Latin name: Calopteryx virgo. They proved to be a little awkward to photograph in some respects, insisting usually on sitting directly facing the sun. Consequently, the magnificent metallic blue of the males’ wings tended to be unlit. Eventually, though, I found one sitting on a pleasantly sunlit leaf in front of a very shadowy rock beside the water. I confess that I have been a little naughtier than my usual self and cloned out a small but distracting blurred leaf that was inconsiderate enough to intrude into the frame at top left. The black is entirely natural, though. I didn’t realize I’d be getting a dark background in this second example. The subject was an unknown critter to me and I was simply anxious to photograph it to add to my insect catalogue. The critter in question turned out to be a Hawthorn Shield Bug. 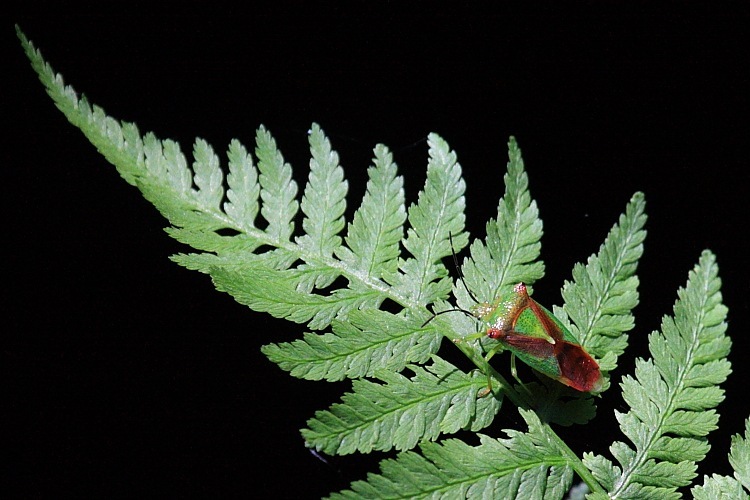 It had the good grace and foresight to pose on a particularly artistic fern leaf – I just love that gracious curve up into the corner of the frame – with no surrounding clutter, poised above a wonderfully dark stretch of La Rigole.